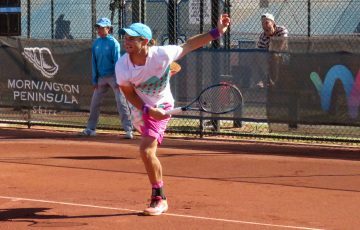 Western Australian wildcard Storm Sanders has continued on her winning way with a gutsy straight sets victory over Julia Elbaba at the Australian Open 2012 junior girls’ event. 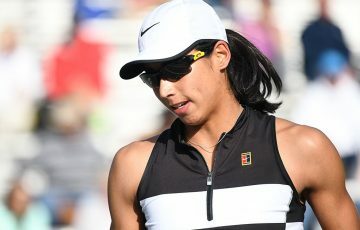 The American qualifier upset the tournament’s thirteenth seed in the first round and looked in good form, but Sanders was the better player throughout in the tough conditions and fully deserved her 6-3, 6-4 win. Despite the heat, Sanders said she felt good on court. Sanders now goes on to meet top seed and world No. 1 junior, Russian Irina Khromacheva, and is relishing the opportunity. “I’m really looking forward to it,” she grinned. 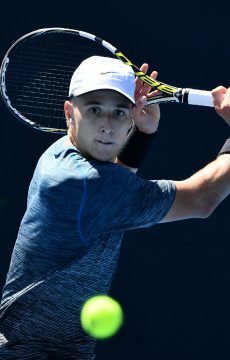 Of the seeded contingent in the boys’ singles, Melburnian No.6 seed Andrew Harris inflicted some revenge against South Africa’s Wayne Montgomery, his vanquisher in the lead-up event. This time around, Harris got through in straight sets 6-4, 6-2. Harris started nervously, dropping his opening serve and spending a great deal of the first set fighting a rearguard action. However, at 2-4 he seemed to relax and start taking control of the match – his return of serve a stand-out. After winning seven games on the trot, he never really looked back, owning the majority of the rallies and racing to victory. Meanwhile, top seed Luke Saville was made to work much harder. He dropped the middle set in his encounter against France’s Lucas Pouille, but eventually moved through 6-3, 3-6, 6-4. Not so lucky was rising young Australian and thirteenth seed, Nick Kyrgios, who despite some great form of recent times, was bundled out today. After handing back multiple set points in the first, he fell away to lose in straight sets to Czech Marek Routa 7-6(7), 6-4. The remaining Aussies unfortunately couldn’t come up with the goods today. Giant killer Jack Schipanski, who earlier dispatched second seed and world No.2 Thiago Monteiro, didn’t have enough for the in-form Canadian, Filip Peliwo, going down 6-2, 6-4. 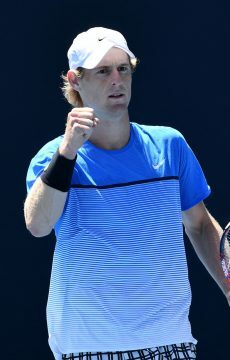 South Australian wildcard Brad Mousley came out of the blocks quickly against his higher-ranked French opponent, Laurent Lokoli, winning the first set without dropping a game. But the Frenchman stuck around, and eventually ground out a 0-6 6-4 6-4 win. It was a case of nearly-but-not-quite for another wildcard today in Chris O’Connell. Like Mousley, he too managed to take the opening set, against fifteenth seed Herkko Pollanen. 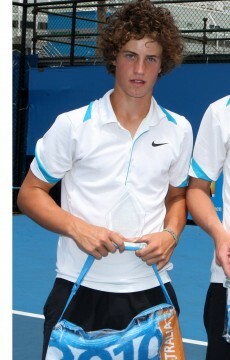 The Fin, however, didn’t lose his cool in the heat and the Aussie bowed out 3-6, 7-5, 7-5. In addition to Sanders it was left to Georgiana Ruhrig to fly the flag for the girls. 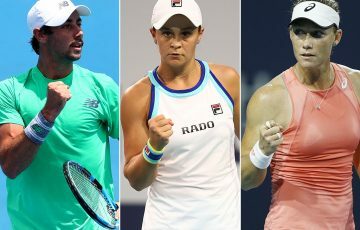 Unfortunately for the wildcard, she was no match for twelfth seed Sabina Sharipova. The Ukrainian was ultra-impressive in winning 6-0 6-2, notching up the victory in just 55 minutes.